Xi'an, formerly the capital of China, was the first to be introduced to Islam. Emperor Gaozong of the Tang Dynasty officially allowed the practice of Islam in 651 AD. Xi'an has a large Muslim community, the significant majority are from the Hui group. Other than Xi’an, the majority of muslim in China (mostly from Hui) also found their home in Xinjiang, located in the northwest of the country which also borders Russia, Mongolia, Kazakhstan, Pakistan, India etc. In here, half of the population of Xinjiang belongs to the Uyghur – a Turkic ethnic group living in Central Asia. So when we’re talking about Xinjiang cuisine, most people would refer them as Uyghur cuisine too, which explains the strong influence of Turkish food with lots and lots of beef/mutton usage in every dish. Sulaiman is not that spacious, probably fits up to 25 people. About the smoking/non-smoking regulation here, I'm not so sure. The grilling/roasting station is located in front, near the entrance, explaining fragrant lamb aroma pervading the entire area. 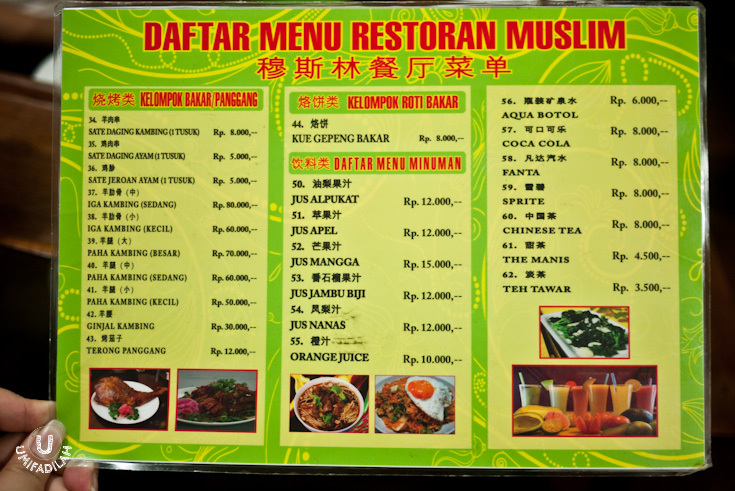 Sulaiman Menu 1: Rice, Noodles, Stir-Fry dishes. Sulaiman Menu 2: Grilled/Roasted dishes, toast & drinks. Here at Sulaiman, their menu is organized into 5 parent categories: rice, handmade pulled noodle, wok/stir-fry dishes, roast/grilled dishes, and toasted bread. These are mainly the staple of Xinjiang cuisine, so I didn’t waste my time by sampling each of these specialties. So let's dig in! You'll know which one's my favorite easily. P.S: Thanks to this blog for the knowledge of the Uyghur food terms. 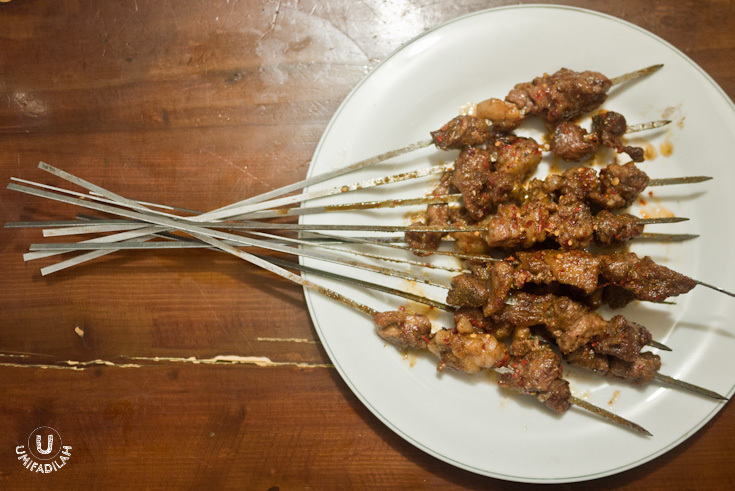 “Sate Daging Kambing” / Roasted mutton kebabs – IDR 8.000 each skewer. It is said to be one of the most famous dish in Xinjiang – so famous that you’d see them in almost every corner of the city. It’s also called “Kawap” in Uyghur language. When our order came in, it took me by surprise seeing those large iron skewers – kinda reminds me of Sate Klathak in Jogja with its unique skewers made of bicycle spokes. There is no dipping whatsoever for this type of Uyghur satay, but I can assure you that this was probably THE highlight of the night. It smells SO good – imagine tender mutton seasoned lightly with salt plus strong hints of cumin and coriander, then grilled to perfection leaving the entire restaurant pervaded by its fantastic smell. Recommended. 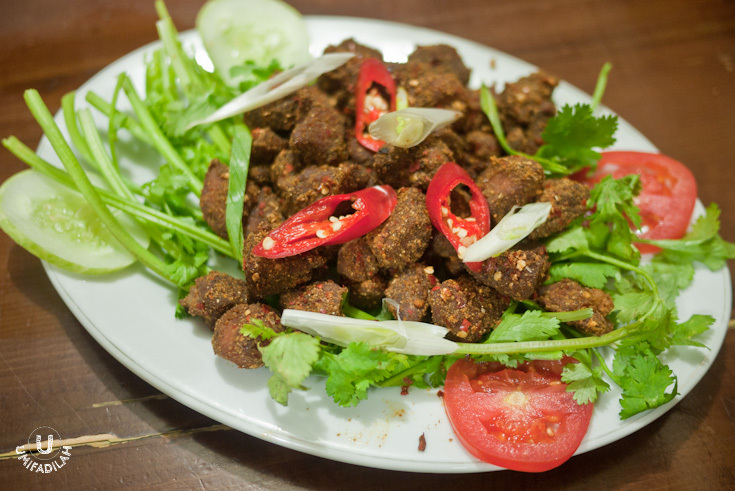 “Daging Kambing Ziran” / Fried Mutton with Cumin – IDR 80.000. We were intrigued by its ‘masculine’ name, and we were right. This is basically mutton seasoned with typical Urghuy strong spices such as cumin seeds, red pepper flakes etc, and it comes with a plateful of cilantro/coriander leaves which really elevates the overall dish. Tasty, but the meat itself weren’t as tender as the kebabs earlier. “Mie daging kambing + daun bawang goreng cepat” / Handmade noodles with quick stir-fried lamb and spring onions – IDR 38.000. The Urghuy people calls them “Laghman”, handmade pulled noodles topped with stir-fry meat and lots of vegetables (mainly tomatoes) boiled in meat stock. Some people also call them “Lanzhou pulled noodles”, and since it’s freshly handmade, the texture is very soft and not as bouncy as I thought it would be. It’s quite an unique dish, different from any other Chinese Lamian I’ve tried before. “Terong Panggang” / Grilled Eggplants – IDR 12.000. Finally a vegetable dish as a meal balancer :p. It’s a very simple dish, but the freshness of the ingredient speaks for itself. Lightly seasoned, and tasty. “Kare Kambing” / Mutton Curry – IDR 50.000. Again, another surprise. Xinjiang’s curry is very different compared to Indonesian or Indian curry. It uses no coconut milk, so it’s not at all thick. Instead, they’re using tomato-based broth to enhance the mutton stock. It somehow resembles the topping of the previous Lanzhou noodles, so honestly I was kinda hoping to get another new flavor. But nonetheless it tasted nice, and back then all I wanted to do was to dip in my naan bread to these light-yet-chunky curry. Great accompaniment. “Nasi Goreng Daging Kambing” / Fried rice with Mutton – IDR 30.000. This nutritious Xinjiang fried rice, or “Polu”/pilaf as the Uyghurs call it, is basically fried rice cooked with vegetable (mainly carrots and spring onions), with eggs and mutton meat. It’s tasty, but if you had to ask me, I still prefer our very own Nasi Kebuli that has more spices into it. 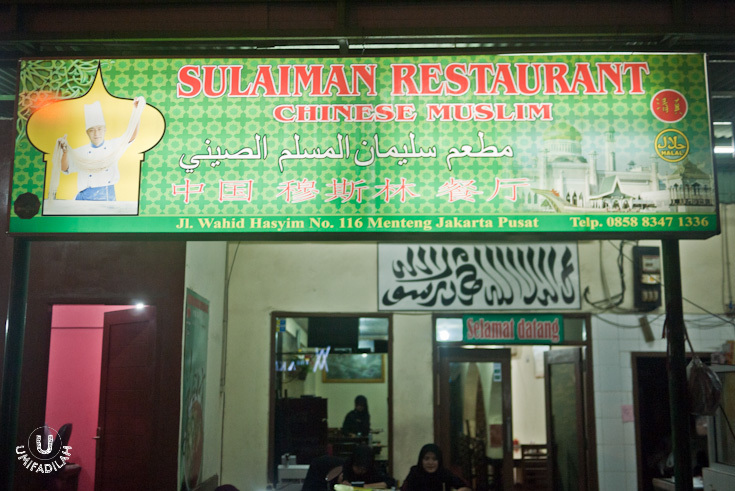 Overall, my first experience on Xinjiang cuisine at Sulaiman was satisfying enough. Satay, fried rice, lamian – it’s like I’m already familiar with the whole menu, but their interpretation of each of it always took me by surprises. Looking forward to having my future visit. Whenever you're feeling adventurous, give it a try. Who knows, right? “Mie Daging Sapi Berkuah” / Handmade pulled noodles with beef soup – IDR 35.000. 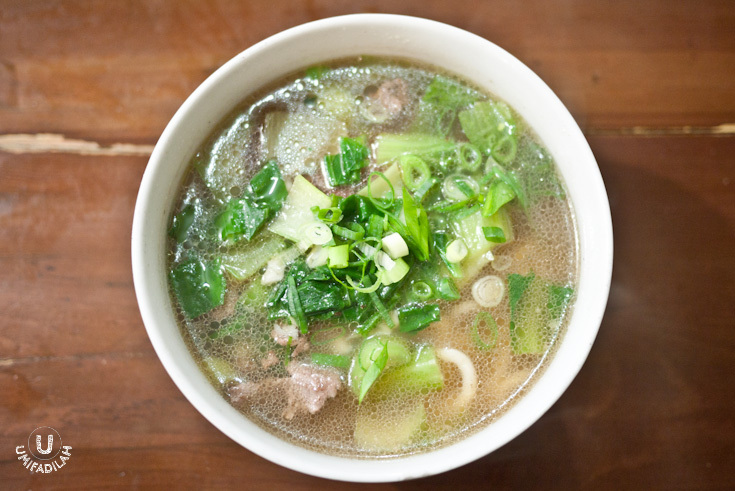 Just by the looks of it, can you tell how tasty the broth is? Yes it was a tad bit oily but oxtail soup has far worse oily broth than this one. The noodle itself was good as usual, with generous amount of beef hidden underneath. “Mie Ayam” – IDR 40.000. Directly translated as “Chicken Noodle”, this sure isn’t your ordinary chicken noodle commonly found in the street. To be honest I was quite surprised when this dish arrived at our table. Ha! This is chicken noodle, Xinjiang style. The thing that made it so distinct is the usage of Szechuan peppercorn, they had to import them from the land of China because there’s no such thing coming close to that flavor here in Indonesia. This dish gives more heat kick and I just love it. Other than full chunks of chicken, it’s also loaded with potatoes, paprika and other vegetables. Handmade pulled noodles tend to have inconsistent size. Some are thin, some gets too wide. Nevertheless, it’s softer than mass-produced noodles. Love it! Oh and did I tell you this time I also get to meet Sulaiman himself? 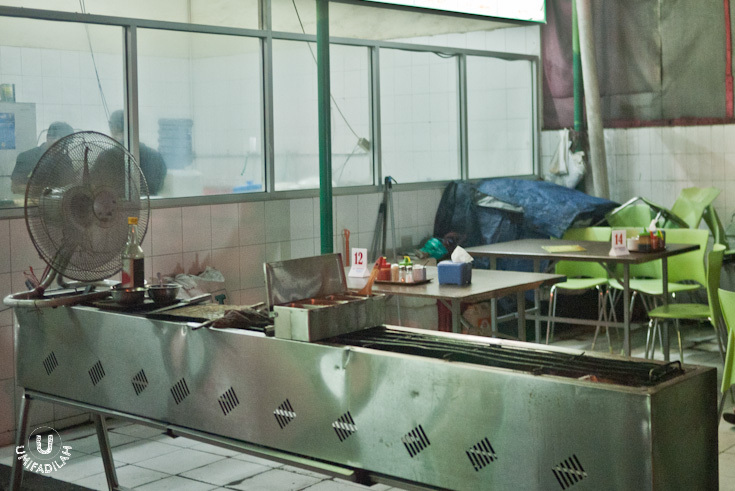 Most of the time he’s always on the grill station, making sure that every Roast Mutton Satay goes out perfectly charred, and seasoned well to perfection. This guy gave me a really sweet smile :) Great restaurant you have there, Sir! I’m a happy customer.